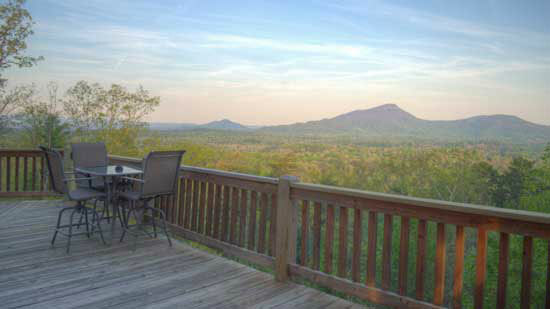 Overlooking the quaint village of Alpine Helen GA, Moondance offers twin peak mountain views in a private, wooded setting! The twinkling lights of the village below melt with the evening stars above to create a spectacular Yonah Mountain light show! Park your car because Moondance is within walking distance of Helen's many shops, restaurants, and activities. 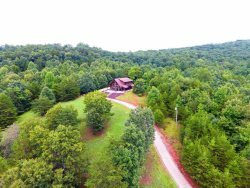 Take the Unicoi Trail (to the right of the driveway) to Unicoi State Park or just the short trail that brings you the back of the property and be sure to bring your camera. If you are lucky you may have souvenir photos of deer, eagles, woodpeckers and YES! Bears! There is something at Moondance for the entire family (including fur babies)! Everyone can join in on the unique experience of life in a mountain resort city! The modern rustic interior of your cabin rental offers an open floor plan bringing in the southern twin peak views of Mt. Yonah and Salls Mountain. The main floor consists of the kitchen/dining area, living room, and master with full bath. In the living room, you'll find leather sofa and love seat, a beautiful stone fireplace (gas) with large flat screen TV and a window seat for that morning cup of coffee. The Master bedroom has a large flat screen TV, and rustic King Log Bed which opens out to the covered porch with hot tub and a rocking chair for an evening sip of wine. Perfect for a couple! A well-appointed loft with sky light, vanity, and twin beds for additional sleeping can be found upstairs, if needed. Just downstairs there is an additional family room with large flat screen TV, foosball table and wet bar with frig. A king bedroom rounds out the space, with flat screen TV, and private bath. Sliders lead out to a covered patio with access to the fenced in back yard and fire pit. Whether its spending time with family or your loved one, its always a relaxing time at Moondance! • Click here to view additional in-town cabins, all within 2 miles of Moondance! • Paved roads and gravel driveway, gentle incline, accommodates 2-3 vehicles. We had a great time making memories with family. We did not need any assistance from your team. This was a very nice pet - friendly cabin for a small family. I would stay here again and would recommend it to others. Moondance was beautiful. It was the perfect setup for two couples celebrating a friends birthday. The view was beautiful! Its so close to town making it really easy to have peace and quiet but also run into town if you need to. We will be back. Always pleasant, friendly and helpful! Loved it. We will definitely plan to come back. Your team was wonderful. They helped me with finding a suitable cabin for having our dogs join in the vacation and were always so pleasant when I called. We adored Moondance! It was the perfect location to recharge our batteries as a family without being on top of each other all of the time. Loved the peacefulness, as well as it being a beautiful place. Also it being pet friendly. They were very nice and easy to work with. My husband and I were absolutely in love with this cabin. If the owner ever wants to sell, we can be the 1st ones to be notified. Lol. We could definitely see ourselves living there on a daily basis. Loved the pet friendly cabin. The Pinnacle Cabins Rentals team are true professionals. They answered all questions we had immediately via phone and email. The location and upkeep of the Moondance cabin was outstanding. The views from the deck were second to none. All of our friends and family were in awe from our pictures. I'm sure they are on the phone right now making reservations to stay there! Ashely was fantastic! I felt so good about booking the cabin because I spoke with her and she had first-hand knowledge of the property. While making our reservations, I spoke to your team by phone. They were extremely helpful and courteous and friendly. Property pictures were accurate as they were advertised. The downstairs den area was very comfortable and would be excellent for a teen-age get-away or extra members of your family. We really only communicated via email, but response time was quick. Information was always complete - more than we would ever need. Excellent experience. Moondance cabin was a delightful surprise! We never dreamed it could exceed our expectations from the beautiful pictures we saw online. It was much larger than we could have dreamed and had everything we needed in place. When we arrived, we were greeted with beautiful lights outside and a Christmas tree lit inside. Wonderful rates and a pet friendly cabin caught our attention online, but we are in love with the cabin and hope to go back for a much longer visit in the future. Moondance is a great property and was so convenient to be able to bring our little furry children to. The views were great. Helen was a little noisy but overall a great base to visit surrounding areas and shops. The scenic loop up to Brasstown Bald was wonderful. And, having the Ingles grocery store close by in Cleveland was great. I would certainly recommend this cabin and Pinnacle to anyone looking for a nice mountain get away. The person I talked to at Pinnacle was very sociable and knowledgeable about the area. Moon Dance Cabin was a very comfortable place to stay.